Get powerful, flexible batch capture and productivity on Kodak and other popular scanners in any scenario - from desktop to high-volume production. Realize greater value with no per click or volume charges. Start scanning right away with preconfigured set-ups and a single, user-friendly interface. Start doing more, more easily. Kodak Capture Pro Software is the one application you need to make, manage and move images and information quickly and efficiently. KODAK Capture Pro Software lets you quickly convert forms, invoices, patient records and other critical business documents to high-quality images. Efficiently capture critical index data, then automatically deliver it all to databases and applications. 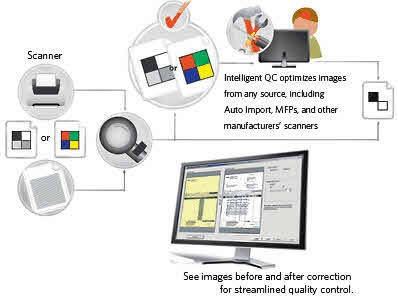 Benefit from new advances in quality control to identify and adjust challenging images without rescanning, enhanced integration with MICROSOFT SHAREPOINT, and more practical innovations. Imports index configuration from SHAREPOINT from a wide array of column types. Easily standardize configurations across multiple users to eliminate concerns about processing or capturing the right data to feed a process.